Discription:Chicken dish with an Indo-Chinese touch! 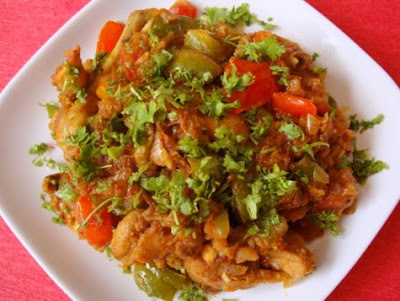 Do use capsicum in this recipe, if you ever try it, as it plays a delightful role, enhancing the over all flavor. Try it and Enjoy!! Marinate chicken with curd, red chilli pwd, pepper pwd, coriander pwd, cumin pwd, turmeric pwd, lemon juice, soya sauce, salt and ginger-garlic paste for at least 2 hrs. 2 Heat half of the oil in a cooking vessel, add the chopped onions and fry till transparent. Add the capsicum and tomatoes and saute for 3 mts. Turn off heat, remove and keep aside. 3 In the same vessel, add the remaining oil, add the marinated chicken and cook on high heat for 4-5 mts, combining the ingredients once in a while. 4 Reduce to medium heat, let the chicken cook for 8-10 mts, uncovered. Add one fourth cup of water and cook till chicken turns soft and there is hardly any water left. 5 Finally add the garam masala pwd and tomato sauce. Add the sauteed onion, capsicum and tomatoes. Combine and cook on high for 3-4 mts. Turn off heat and garnish with fresh coriander leaves. This is a semi-dry dish with less gravy. 6 Serve hot with white steamed rice, rotis or naan.